The Vinery Hair Salon: My first time…with Permanent Make Up! The Vinery Hair Salon in Huddersfield has teamed up with Michaela Hammond at Divinity Beauty Rooms after we were inundated with professional recommendations about how skilled Michaela is at Permanent Makeup application. As a bit of a hair and beauty aficionado (hey I work in a salon!) 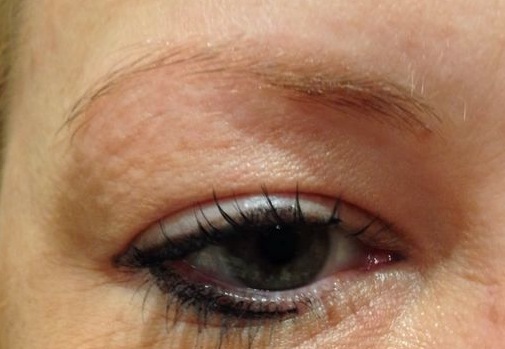 I was very keen to find out more about permanent makeup after hearing horror stories (through general gossip) about how painful the experience is, how the makeup (which is essentially a tattoo) can look awful / fake / overdone and its safe to say I was approaching the whole idea with a degree of trepidation. However Michaela soon set my mind at rest. She explained about her extensive background and training (Michaela also teaches permanent makeup application at Elite in Liverpool!) and about the various specialist techniques she uses to create a natural 3D effect on the brow area as well as eyeliner and lip blush/liner applications. So, after a good long chat over several cups of tea (It's safe to say that for poor Michaela it probably felt more like an interrogation than a cosy chat!) 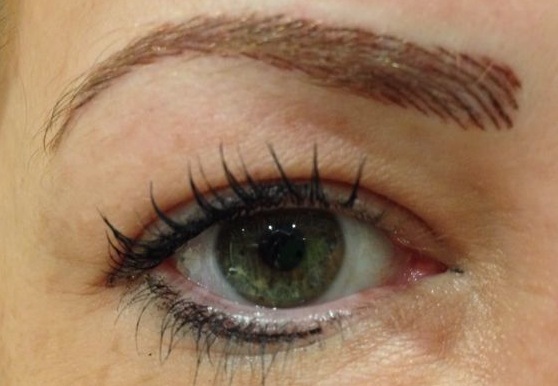 I felt 100% more comfortable about the procedure and booked in for Permanent Brows. Following many years and lots of ££££ on regular tinting and products (brow palettes, pencils you name it I bought it) the idea of Permanent Makeup made sense. The Brows last between 18 months and 2 years following a complete treatment (the procedure takes place over two appointments - the first is the actual application and the second is 4 weeks later for the top-up) and cost £375 - averaging out the maintenance cost currently spent on managing my pesky brows I estimated I spent roughly between £20 and £25 a month over the year - a whopping £270 a year - or to put it into perspective roughly £540 every two years. So paying £375 for brows that would last me 2 years seemed like a no brainer - I'm actually saving myself £165 that could be spent in Kurt Geiger or the next Net-a-Porter sale! So my purse was happy and my mind was at rest - now the real test was to actually go ahead. So this week I headed to The Vinery for my appointment with Michaela. The appointment lasted for 2 hours, the first hour consisting of a very precise consultation. After going over some paperwork, Michaela measured my brows, assessed the movement in my face (to see how my brows move with my facial expressions) she then colour-matched to the depth of tone that I wanted for my brows, and drew in the shape that I was hoping to achieve. Even though she had only used pencil for this part of the appointment it was clear to see the dramatic change that proper brows would make to the definition of my face, I was thrilled! Michaela constantly checked to see how I felt about the shape, thickness, depth of tone and effect of the brow which reassured me that she was listening to my exact requirements. So, once the consultation was out of the way it was time for the needle. I must admit as I reclined on the couch and heard the needle whirring I had flashbacks of being in the dentists chair! 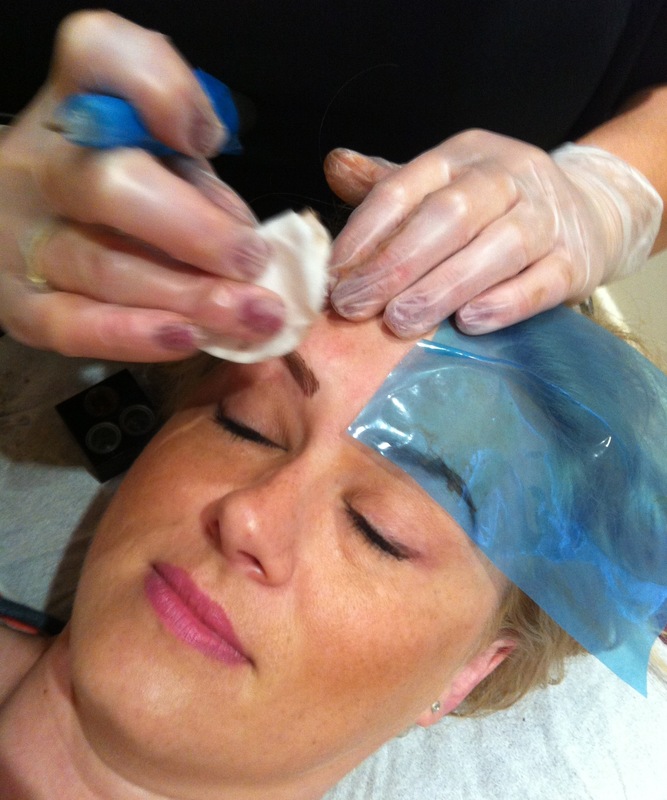 Michaela had already prepped my brows with some numbing cream and she began with the outline of the brow before anaesthetising the brow area. Each step I was asked how my pain level was on a scale of one to ten as Michaela does not believe in pain - she believes it should be a relaxing experience - hard to believe but once i was undergoing the procedure I almost fell asleep! The entire process felt as though someone was tickling my forehead - the sensation is like someone pressing lightly on your skin with an electric toothbrush - you can feel it but its not painful, just strange! In what seemed like no time at all Michaela asked me to sit upright so she could finish off with some freehand styling techniques. The entire procedure took less than 2 hours and the results - well WOW!!! I was blown away with how defined my brows looked - and how they really brought out features such as my eyes (and seemed to lessen my wrinkles!!). Michaela advised me on aftercare and I have an appointment in four weeks for a top up (which is complimentary and part of the two-part procedure). I can honestly say that the entire experience was fantastic - Michaela is meticulous in her attention to detail, really listened to my concerns and what I hoped to achieve from having Permanent Makeup. I got the results I wanted and more - it is safe to say they completely exceeded expectations! See below for my before and after pictures..what do you think?